In the early seventeenth century, Narragansett Native Americans occupied most of Rhode Island, from Narragansett Bay on the east to the Pawcatuck River on the west. They were the largest and strongest chiefdom in New England. They escaped the great pestilence of 1617 that swept through southern New England, and the remnants of other tribes who had suffered joined them for protection, making the Narragansett a powerful tribe. The word Narragansett means the people at the small narrow point. They were of the Eastern Woodlands culture. They were made up of several sub-tribes, each with a chief (sachem). Their population was around 10,000 in the 1600s. When the English began colonizing New England in 1620, the Narragansetts had not been affected by the epidemics, and were the most powerful native nation in southern New England. The Narragansett spoke a Y-dialect of the Algonquian language, similar to the N-dialects of their neighbors, the Niantic and the Wampanoag tribes. Speakers of Algonquian languages stretch from the east coast of North America all the way to the Rocky Mountains. In 1636, Roger Williams acquired land use rights from the Narragansett, and established the colony of Rhode Island. The colonists quickly came into contact with both the Narragansett, Wampanoag, and Niantic Sachems, or Chiefs. Williams learned the tribe’s language, documenting it in his 1643 publication, A Key Into the Language of America. A number of words have been absorbed into the English language from Narragansett and other closely-related languages. Those words include quahog, papoose, powwow, squash, and succotash. They were an eastern woodland people. Their subsistence came from the farming of corn, beans, and squash. They also grew tobacco for smoking and medicinal use. They spent a great deal of time in the fields tending their crops. They gathered nuts, berries, and other plants in the forest. They were also very skilled hunters and fishermen. Small game, fish, and seafood were used to supplement their diet. All of the Rhode Island Native Americans moved during the year to where food was readily available. 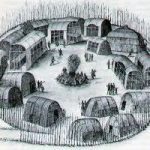 At the beginning of summer, they moved to the shore and built wigwams or wetus, Native American houses used by Algonquian-speaking peoples in the eastern woodlands. The frame of the house could be shaped like a dome, a cone, or a rectangle with an arched roof. Once the birch bark was in place, ropes or strips of wood were wrapped around the wetu to hold the bark in place. These natives also spent a great deal of time building and repairing canoes, which were their primary means of transportation. The canoes they dug out of trees were large enough to hold up to forty men. During the Pequot War in 1637, the Narragansett were allied to the New England colonists. But the brutality of the English shocked the Narragansett, and they returned home in disgust. Yet they maintained good relations with the Europeans until King Philip’s War. King Philip’s War (1675-76) was the last major effort by the Indians of southern New England to drive out the English settlers who wanted more and more Indian land. Setting aside tribal tensions of the previous five decades, the Narragansett became allies of the Wampanoag under the leadership of their Sachem, Metacomet, who was called King Philip by the English. Narragansett and Wampanoag warriors waged a guerilla war against the colonists of Rhode Island, Massachusetts, and Connecticut. Native forces had burned the settlement of Newport to the ground and heavily damaged Providence, and waged successful attacks on settlements in Massachusetts and Connecticut. The English declared war on the Native Americans. The allied native forces began to run low on supplies and retreated to northern Rhode Island to open a cache of corn. 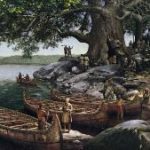 The Pequot of Eastern Connecticut, now allied with the English, knew about the cache, and helped the colonists ambush the native warriors while en route. Rhode Island colonists converged on the Great Swamp in southern Rhode Island, where the Narragansett had built a palisaded fort that housed the women, children, and elderly of the tribe. Seeking retribution, the Rhode Island colonists attacked the fort. Hundreds, perhaps thousands, of women and children were killed in that attack, which may be better labeled a massacre. After the war, the remaining Narragansett were forced to live on reservation lands, but by the end of the 18th century, the reservation lands had been drastically reduced. The state of Rhode Island took away the Narragansett’s tribal status during the 1880s, which meant that they were no longer recognized as a tribe. The Narragansett have tried to maintain their tribal customs and traditions, but it wasn’t until the 1970s that they were able to reclaim part of their land. 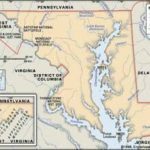 During the 1980s, they finally received Federal recognition as a tribe. According to tribal rolls, there are approximately 2,400 members of the Narragansett Tribe today. The Narragansett occupied the greatest share of Rhode Island in the early seventeenth century. The other two tribes living there were the Niantic and the Wampanoag. These peoples shared similar languages and cultures, though they struggled to maintain their own way of life. The Niantic Native Americans lived in Connecticut and a small portion of Rhode Island when the Europeans arrived in the New World. Their tribal name means of long-necked waters, believed to refer to the long neck or peninsula of land now known as Black Point that is just out into Long Island Sound. 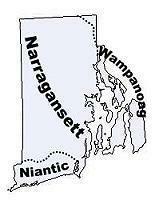 Due to intrusions by the Pequot tribe, the Niantic were divided into an eastern and western division. The Western Niantic lived just east of the mouth of the Connecticut River, while the Eastern Niantic became very close allies to the Narragansett. Conflict broke out between the Niantic and their colonial neighbors, leading to military expeditions that dealt out massive destruction in contrast to the rather limited incidents that had provoked the conflict. As the violence became more widespread, it evolved into the Pequot War in 1637, which resulted in almost total destruction of the Western Niantic. 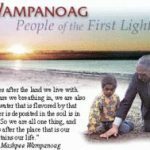 There are members of these tribes who can trace their ancestry back to those members, especially in the vicinity of Lyme, Connecticut. 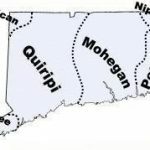 Some of the Niantic who joined the Mohegan and Pequot fled west to escape further English harassment. After King Philip’s War, many surviving Narragansett fled to the Eastern Niantic, and many modern-day Narragansett have significant Niantic blood. It is believed that the last living member of the Niantic tribe died in the 1930s. The Native Americans who lived in the area where the Pilgrims chose to establish their new plantation, the Wampanoag tribe, were kind to the settlers at Plymouth Colony. Squanto acted as an interpreter and go-between for the colonists, and their chief, Massasoit, signed a peace treaty with them that lasted many years. They taught the Pilgrims how to plant corn, to capture fish and seafood, and shared their own food when the colonists were near starvation. One of Massasoit’s men, Hobbamock, lived just outside the stockaded walls of the Colony and warned them when danger was near. Relations between the two groups deteriorated after Massasoit’s death, but the Pilgrims had many peaceful years in which to establish the new colony. In 1600, the Wampanoag probably were as many as 12,000 with 40 villages, roughly 8000 in what would become Massachusetts and eastern Rhode Island, and 4000 on the offshore islands of Martha’s Vineyard and Nantucket. The three epidemics that swept across New England between 1614 and 1620 were especially devastating to the Wampanoag, with mortality in many mainland villages reaching 100%. Wetu is the word for house used by the Wampanoag tribe. 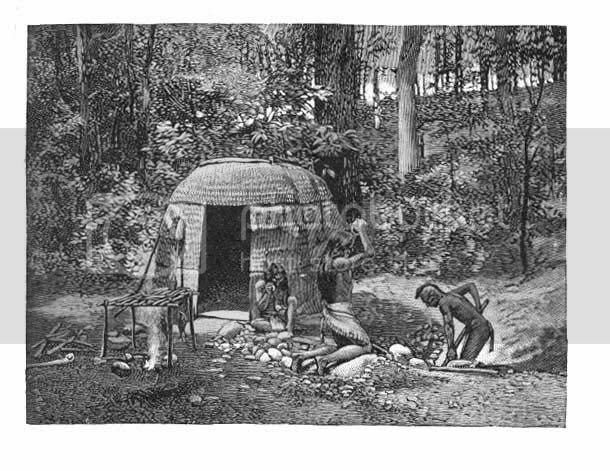 These were small temporary shelters made of bark on the outside and woven mats on the inside, usually eight to ten feet tall. Each family lived in its own wetu. Their winter home was called a long house, in which up to 20 families lived during the cold months. When the Pilgrims landed in 1620, fewer than 2000 mainland Wampanoag had survived. Those on the islands were protected somewhat by their relative isolation and still numbered 3000. The tribe became close friends of the Pilgrims at Plymouth Colony. Their Sachem, Massasoit, and several others attended a harvest festival held by the Pilgrims after their first harvest in the autumn of 1621. After 1630, the original 102 English colonists who founded Plymouth were absorbed by the massive migration of Puritans to the Massachusetts Bay Colony. The Puritans’ attitude toward Native Americans was not one of friendship and cooperation. The English expanded west into the Connecticut River Valley, and destroyed the powerful Pequot Confederacy that opposed them there. Between 1640 and 1675, many new settlers arrived in New England and pushed west into native lands. While the Pilgrims usually had paid or asked permission, the Puritans were inclined to take. By 1665, Native Americans in southern New England were simply in the way. The English no longer needed their wilderness skills to survive, and fishing and other commerce had largely replaced the fur and wampum trade that had been the mainstays of the colonial economy during the early years. The Wampanoag were nearly exterminated during King Philip’s War. Only 400 survived, and they were relocated. The Wampanoag Peoples now have their own reservation on Martha’s Vineyard. They have their own government, laws, police, and other services, just like a small country. But they are also United States citizens and must obey American law. There are about 300 there, but many other people of Wampanoag descent live elsewhere in Massachusetts and Rhode Island.